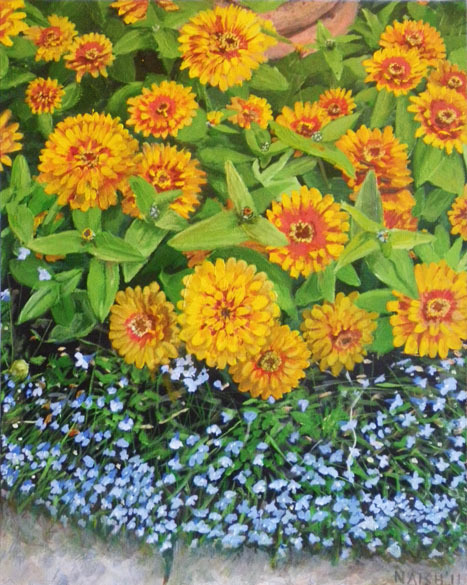 The final Garden shot in this short series of paintings is from the Stockwood Discovery Centre in Luton. In fact I am not 100% certain that the photo itself doesn’t date back to when it was the craft museum, but this Victorian Garden area has remained fairly much unchanged. I liked the idea of a detail. This ensures that the flowers themselves create the composition more rather than any specific Human intervention. Also, there is still a certain mystery about what is path and what is urn etc. Hopefully enough is revealed to create a pleasing composition that still makes sense. The fact that this picture is a detail links the piece thematically to the other three canvases. I feel there is a danger that this detail aspect could lead the pieces to be seen more as exercises than works of art. By definition there is no real depth to these images, and they become a little “textile design”. I do think the exploration of shape, pattern and colour has been worth it, however.